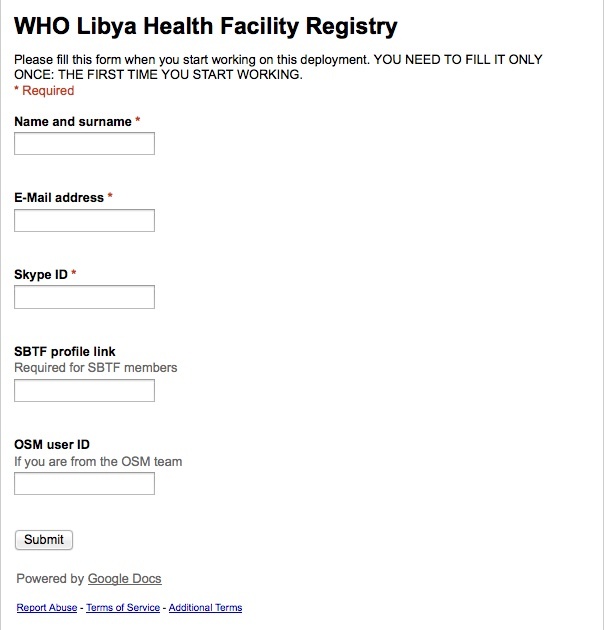 for the Vulnerability and Risk Analysis & Mapping (VRAM) inside the WHO Mediterranean Center for Health Risk Reduction (WMC) based in Tunisia contacted the SBTF, OSM and GISCorps to request support on a project related to the public health system in Libya. The purpose of the project was to get a final Health Facility Registry GIS layer for Libya, which would include the location type and name of the Health Facilities (HF) across the country along with their status. This was to be the starting point for providing a crucial service to the local community since the public health infrastructure was starting to get back “online” as it’s capacity was starting to increase again, which would benefit the entire community and citizens. Still there were some gaps in the layers and there was a need to identify and complete them. 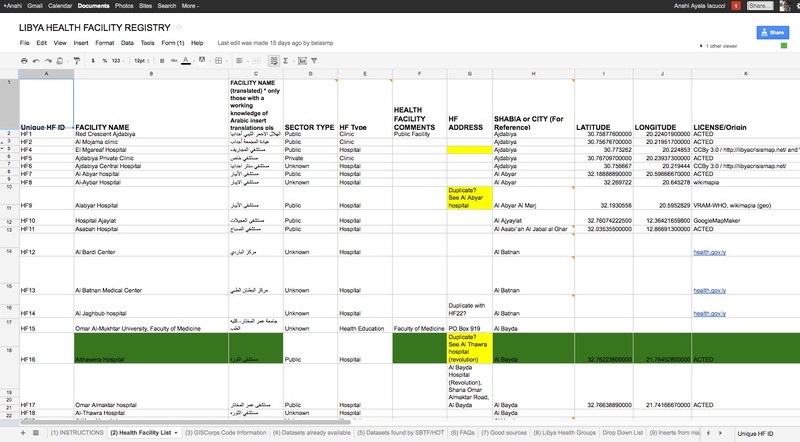 WHO had two WHO staff already in Libya working on this specific project (collecting data, points, visiting places…) but they needed to be more precise in their approach, which is why they wanted to make sure we could gather all the existing, valid and original datasets. The volunteers were coordinating all their efforts using a dedicated Skype Chat (standard operating procedure for SBTF deployments), and both the Skype Chat and the Application Form were shared with OSM in order not to duplicate efforts. The deployment run through the entire holiday period (December-January) and was paused for a couple of days to allow GIS Corps to clean and delete duplicate data from the information found by the volunteers after the first 2 weeks of the deployment. 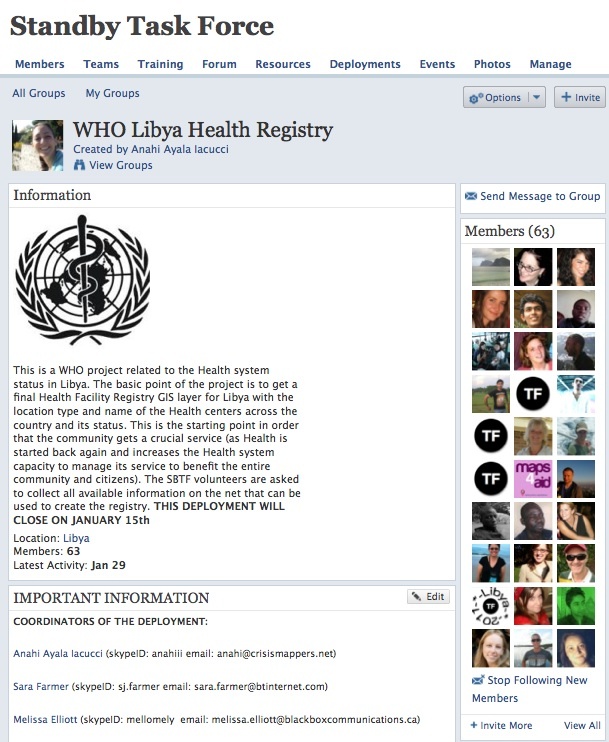 At the end of the deployment, when it was clear that no more information could be found on the web, the SBTF phased out of the deployment, giving way to the the second phase of the project: HOT/OSM created a web interface to allow anyone from Libya to add information missing on the health facilities founded by the volunteers, or to add new facilities not already inserted. WHO has already described this project in detail in their guest blog post here, so I will use this post to describe a bit more the SBTF’s involvement in this project and will share the comments, feedback, opinions of volunteers who participated in this novel public health deployment. Overall the SBTF had 76 volunteers participating in the deployment, 12 of them from the OSM team, and most of those part of both SBTF and OSM networks. The average amount of time spent daily by each SBTF volunteer on the deployment was 75 minutes, with some volunteers working 3 hours in a row and some no more than 10 minutes. In general the majority of the volunteers did around 1 hour a day. The major problem that volunteers highlighted was related to the different spellings of the local locations and the difficulties in finding addresses on any available maps on line. This was frustrating and time consuming for volunteers – and gave our colleagues at GISCorps a lot of work vis-a-vis the data cleaning operation after the first two weeks of the deployment. Thanks to the feedback and suggestions provided by SBTF volunteers, we were able to adapt and make changes to the deployment several times throughout the project life cycle. For example, we added a column for the phone numbers of individual facilities, another one for the web address, and another one with the status of that entry. We also added a dedicated page to compile all the useful sources found by the volunteers. This enabled others to do some cross-validation and verification. Almost 90% of volunteers found the Skype Chat useful and a good way to ask questions, share information and learn about what others were doing and how. Some volunteers emphasized that they found the Skype Chat particularly important for the “spirit”. Being able to chat with each other while working was a definite plus and a form of ongoing encouragement. 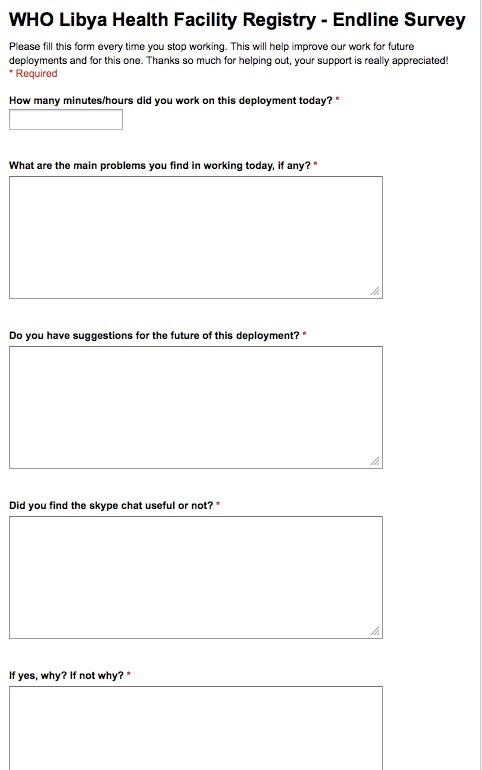 The majority of the volunteers used the chat to get quick feedback on their questions and to get up to speed of what was most needed. Unfortunately, since the majority of the volunteers were based in the US, whom was in a different time zone, was left almost alone in the Skype Chat. Having the activators in the skype chat with the volunteers was incredibly useful. Robert Colombo was supporting and coordinating the volunteers on a daily bases and this gave them also a very good understanding of the use of the data collected.